Otoscopy method of examination of the ear. For otoscopy necessary light source and the front reflector, reflecting the beam from the light source to the study ear. Doctor and patient setting one against the other. 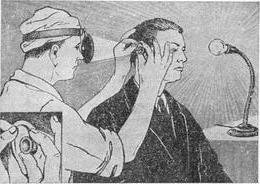 The light source is located to the right of the patient at the level of his ear, several backwards from him. Directing reflected from the frontal reflector beam of rays on the study ear, doctor lights and examines it (Fig.). When otoscopy can be examined by the ear canal and eardrum, and if there are holes in it - and the tympanic cavity. Straightening axis ear auricle pulled backwards and upwards (in young children auricle have to wait backwards and downwards). To direct the beam of light directly on the walls of the ear canal and eardrum, and enlarge the cartilaginous part of the ear canal is used ear funnel. The set includes three craters of different diameter. Picking up funnel according to the width of the ear, it is administered to a depth of about 1 cm; a deeper introduction funnel painful and aimlessly as the bone part of the ear canal can not be extended. The introduction of ear funnel often causes a cough due to irritation of the branches of the vagus nerve. When sufficient width of the ear and the lack of hair otoscopy can be made without an ear funnel. For otoscopy in children using a special, more narrow funnel. Narrow craters have to use and when otoscopy adults in cases when there is an abnormal narrowing of the external ear canal. When otoscopy in young children need an assistant who put the baby on her lap, capturing the child's leg between his legs and hold his arms and torso right hand, and his head to the left. For a detailed examination of the eardrum and the tympanic cavity using a magnifying glass 8-13 D.
Otoscopy (otoscopia; from the Greek. ous, otos - ear and skopeo - examine, investigate) - method inspection of the external ear canal, the tympanic membrane, while punching her and tympanic cavity. For normal otoscopy you must have lighting device, frontal reflector and a set of ear funnels (see Otorhinolaryngology tools). Despite a number of advantages when using daylight and solar radiation (visible normal - pearl-grey eardrum, tiny vessels when the redness of her, effusion in the tympanic cavity), the use of daylight limited. Otoscopy sunlight can cause burning of the eardrum. Currently, as a light source use the electric light bulb. To reflect the rays of light use frontal reflector. In the reflector, suitable for Acting, focal distance is 15 cm and the diameter of mirror - 7,5-9 see for refractive errors correct vision glasses or lens, is placed behind the reflector. Frontal lamp Clara and Kirsteina - Killian worn on the head researcher, replace the front reflector. The otoscopy produce metal craters, which can be boiled. Inner walls of craters Matt avoid light reflexes that hinder the inspection. Due to the differences in the lumen of the ear canal in each set contains three craters, the inner end of which has a different width. Methodology otoscopy. The light source have on the right side and several posterior to the patient sitting at the height of his ear. The doctor sits down in front of the sick and against the light source. Patient head is turned in the direction opposite to inspect your ear (90 degrees). This helps to match the longitudinal axis of the external ear canal with the direction of the light rays reflected by the reflector. Because the ear canal bent down and anteriorly, for rectification need two fingers of the right hand (better thumb and forefinger) to pull the ear up and back (Fig). Straighten the channel of the external ear canal can and pulling backwards and upwards ear middle finger of the left hand, placed in a pit shell (cavitas conchae). In infants the ear should pull back and down. Generally when Ottaviani finger trestle is sometimes possible to examine the ear canal and eardrum even without a funnel. The introduction of ear funnel in the ear canal produces light rotational movements; the funnel in the ear canal keep your thumb and index fingers of the left hand. Funnel small rooms (narrow) are used not only at children but also at abnormal narrowing of the ear canal (for example, with limited and diffuse inflammation). To determine the mobility of the eardrum, the presence of her scars and other changes instead of the usual funnel use funnel Sigle. Outside it is closed obliquely installed glass plate, and the side has a hole, United with a rubber balloon. Thickening or negative air pressure in the passage of the eardrum ranges (this can be seen through the glass plate). For a detailed examination of the ear resort to biconvex lupam (7-10 D). The otoscopy produce both for diagnostics, inspection and for operations under otoscopes control. Cm. also the patient Survey (ENT).